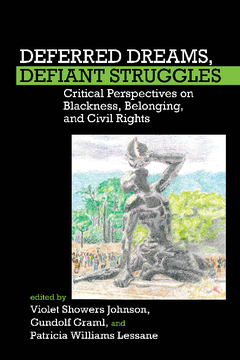 Deferred Dreams, Defiant Struggles interrogates Blackness and illustrates how it has been used as a basis to oppress, dismiss and exclude Blacks from societies and institutions in Europe, North America and South America. Employing uncharted analytical categories that tackle intriguing themes about borderless non-racial African ancestry, “traveling” identities and post-blackness, the essays provide new lenses for viewing the “Black” struggle worldwide. This approach directs the contributors’ focus to understudied locations and protagonists. In the volume, Charleston, South Carolina is more prominent than Little Rock Arkansas in the struggle to desegregate schools; Chicago occupies the space usually reserved for Atlanta or other southern city “bulwarks” of the civil rights movement; diverse Africans in France and Afro-descended Chileans illustrate the many facets of negotiating belonging, long articulated by examples from the Greensboro Woolworth counter sit-in or the Montgomery Bus Boycott; unknown men in the British empire, who inverted dying confessions meant to vilify their blackness, demonstrate new dimensions in the story about race and religion, often told by examples of fiery clergy of the Black Church; and the theatres and studios of dramatists and visual artists replace the Mall in Washington DC as the stage for the performance of identities and activism. Violet Showers Johnson is Associate Dean and Professor of History in the College of Liberal Arts, Texas A&M University. She is author of 'The Other Black Bostonians: West Indians in Boston, 1900-1950' (Indiana University Press, 2006); co-author of 'African & American: West Africans in Post-Civil Rights America' (NYU Press, 2014); and co-editor of 'Western Fictions, Black Realities: Meanings of Blackness and Modernities' (Lit Verlag and Michigan State University Press, 2012). Gundolf Graml is Associate Professor and Director of German Studies at Agnes Scott College, Decatur, Georgia, USA. Patricia Williams Lessane is Executive Director of The College of Charleston’s Avery Research Center for African American History and Culture, and tenured librarian at Addlestone Library.